I just dropped one of these into the panel of a musical puzzle box that I built for some kids. The indicator moves up from zero to 5V as they play the right notes, and it drops to zero when they make a mistake. Very cool, with the needle jumping to (and overshooting) each new position, and it really helps the kids solve the puzzle. link is broken. Anyone else have a link? Looks like that site in general is having issues. You can read the post through the wayback/internet archive. I noticed that I needed a 9v power supply on my Arduino to make these go the full scale, the 5v supply I was using yielded only only about 3/4 deflection at full PWM output. Were you trying to power your Arduino through the barrel jack using a 5v supply? The MC33269D-5.0 voltage regulator on the UNO can drop up to 1.35v off whatever you power it with, which could explain the 3/4 deflection. But you've had success since? I'm considering purchasing one of these to use with analogWrite(). Has anybody ever put together an Audio VU meter with this? I"m trying to put some together to build an analog mixer for my studio. This would be good for a (analog) battery meter or a science project with solar power or a lemon/potato battery. Check out the forum. I know we have had customers in the past mention doing this, so hopefully you can find someone through there who might be willing to share templates. I'd really like a meter that had a range like -X to +X. I am very disappointed with this meter. Not only does it NOT have a zero adjust, but the full scale deflection was over 6 volts for me. I Had to not only open it up to manually twist the assembly so that the needle pointed to zero, I had to change the resistor so that the meter was actually 5V full scale. I'm very disappointed that Sparkfun would sell such a low quality item. Can I remove the background of these without damaging it? 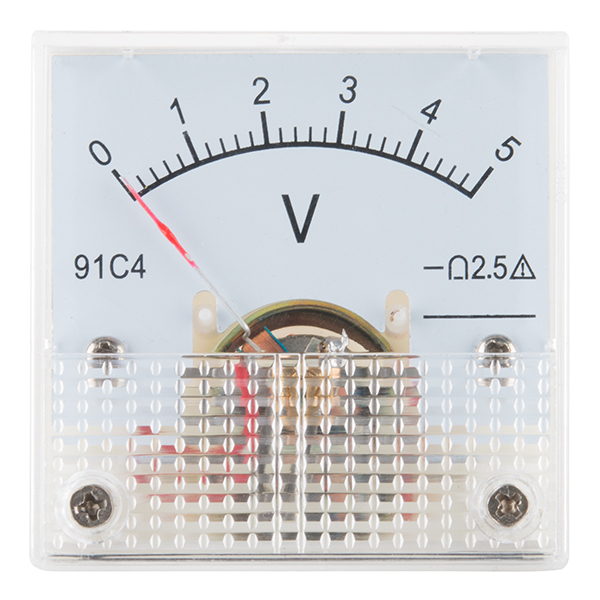 These are pretty simple to adapt as a voltmeter or ammeter over a wide range. 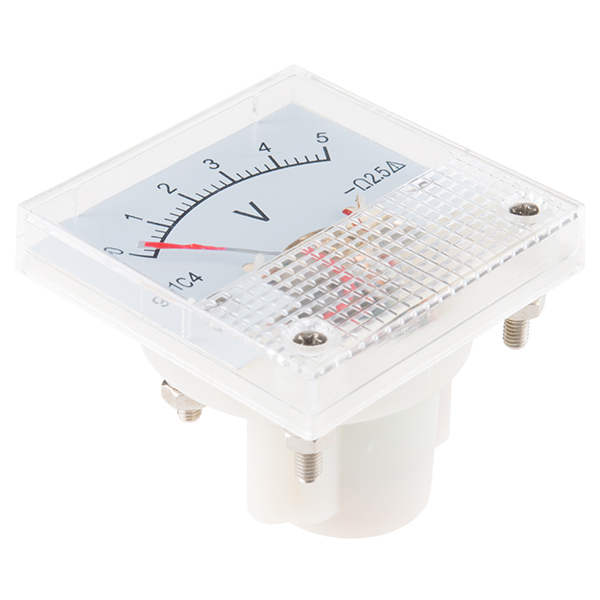 The meter movement needs about 230mV for full scale deflection (fsd). The 5V version has a 5k series resistor to give fsd at about 1mA. 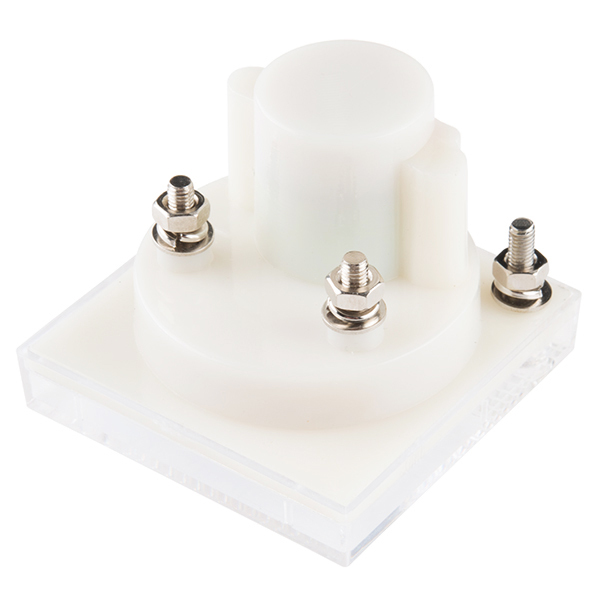 You can adapt them for any fsd voltage above 1/4 Volt by changing the internal series resistor. A multi turn trim-pot is the easiest way to get it right. 10k will give you up to about 10V, 20k for 20V etc. For an ammeter it's a bit harder as you need a shunt resistor across the terminals to carry most of the current. Calculate the resistance to give 250mV across it at the current you want as fsd then add a low series resistor inside the meter to bring the fsd back to the correct point. I made a replacement 5A meter for my battery charger with a 0.05 Ohm shunt (two 0.1Ohm power resistors in parallel) and needed a 10 Ohm series resistor to get the correct reading. I've been looking for these for months! Will they be back in stock soon? Just got in a couple of these, they measure about 6.9K ohms. That would place it at about 0.72mA for full scale displacement. There is an internal resistor that you could change if you wanted different scale. I didn't look at its value. Just a note, one of the two I purchased didn't work. Opening the meter, the wire connected from the stud on the back to the movement had fallen off. I just resoldered it and it works fine. It is easy to disassemble these meters to change the scales or resistors. So I should be able to drive one of these with the PWM pin of an ATtiny45 correct? Um, how do you connect these to a circuit? There appears to be a line molded onto the back next to a screw, which might be a -, but there's no +. Is it just the two upper screws on the back? This looks like a great little component that you could use as a generic analog display. Any chance that background card is removable? Its made of aluminium not card to keep it rigid(I think), I'm sure you could try card as long as you make sure its thin, Its about 1/2 a mm(I measured), The two small screws under the plastic screen are easy to get too, this component is cool, but is a little difficult when mounting. I think you need a little glue too for the top of the plastic cover as when you take it off the glue breaks(which I didn't realize until I'd taken it off). The product sheet show 0-250V, 0-2A, 0-20V, 0-50mA and 0-50ï¿½A ones. Will you carry them someday? anyone know where I can found a similar panel for 20 V? Google Voltage Divider. They work amazing, I needed one to adapt an arduino to amp meter that pegged out at .09V. Yay! I've been looking for little meters, they've gotten hard to find! LEDs are great, but nothing beats the swinging needle for that dynamic pulse. The 5V meter is just right to drive with an Arduino PWM pin, using analogWrite(). Looks like it can be opened up to put in a custom laser-printed scale. (Who will post a template?) We do need to know the sensitivity in ohms per volt. Thanks! How much current does this meter draw, or what is the input impedance? appeared to be broken, but may just be the zero adjust. (*accessible one you take off the clear plastic cover.) accuracy is a bit worse than expected- i am looking at closer to 5%-10% error. it does lend a kind of cool look though. I will revise if i see better result beyond "the breadboard"
I seems to be working correctly. Th price is great. McMaster Carr wants $100 for panel meters. 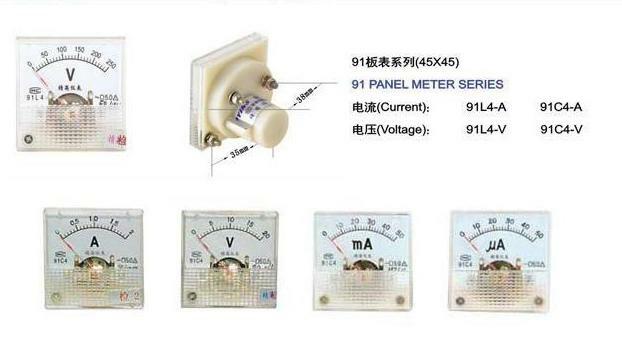 I expected the voltmeter to look same as it's shown in the picture, but it wasn't There are no adjusting screw in the real product as in the picture. I'm little bit frustrated. 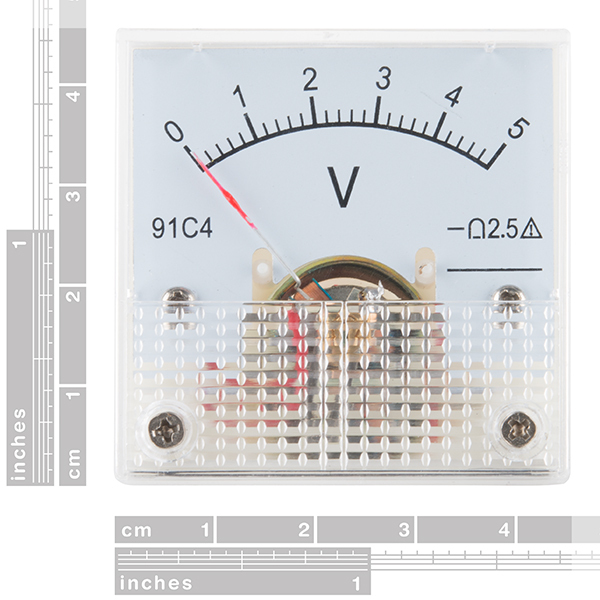 I got this and I was expecting to a cheap plastic face, but the whole feels very sturdy, I'm not entirely sure however about the accuracy, this versus my multimeter gave me a +/- 0.25 volt reading, which in the grand scheme of things isn't that big of a deal. Overall, it's fantastic. These meters met my expectations for the project that they were intended for. Small size and accurate for analog meters. I mistakenly thought there would be set screw, but turned out, wasn't, my fault, didn't read description.....But, otherwise well made, enough accurate meter, kinda cute, being so small. Okay, back to topic, since it's DC meter, polarity matters, and it's marked backside (negative is marked, but enough) Good if you need approximate reading, not that precise, just what I was looking though with.